The Flexbone offensive line should be built from the inside out. 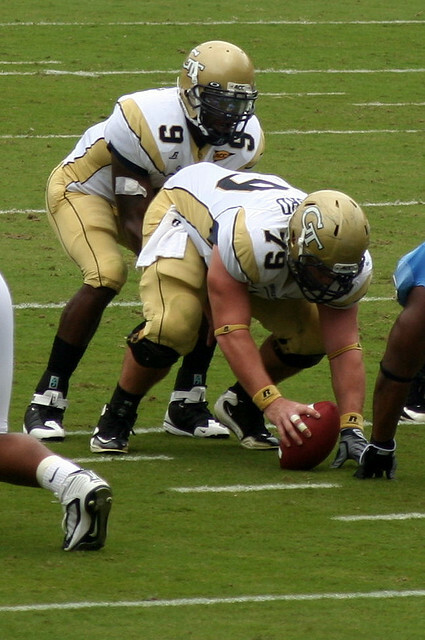 Flexbone offensive line play is predicated on technique, angles, and a high level of tenacity. With tenacity, in my opinion, being the most vital for success. These attributes become increasingly important when considering that many coaches choose the Flexbone (or other option offensive schemes) because they do not have a great deal of size and conventional ability in trenches. It isn’t a coincidence that the service academies run the option. Option football helps to reduce the need for a physically dominant offensive line and also offers a few other advantages for the boys in the trenches. One advantage from an option perspective is removing the need to block one or more players at the points of attack. If done appropriately, as outlined on my option football theory page, this creates a fast break situation on the football field. With a triple option play (Inside Veer, Outside Veer, etc.) we get a 3-on-2 fast-break where the defense must defend three offensive players with only two defenders. On a double option play (Midline, Speed, etc.) it becomes a 2-on-1 situation The offensive line no longer has to physically move the specified defenders all over the field. They are blocked by the quarterback’s read. Leaving players unblocked effectively inserts one or more players into the blocking scheme. This gives the flexibility to get a double team on a key defender or to gain an extra block at the second or third level. Both of which are desirable outcomes when your offensive lineman are undersized. Option football also causes uncertainty in the defense on nearly every play. Uncertainty in the defense leads to slower reactions times, which again reduces the need for physically gifted players up front. The Flexbone offensive line also takes larger than average splits to help create a horizontal stretch and widen running lanes. This further reduces the need to move defenders and allows for techniques that wall off defenders rather than pushing them large distances. Once again, this is ideal when dealing with smaller offensive lineman. Still, it is essential to develop the afore mentioned tenacity and nastiness in each of your starters. This is true for football players in general, but is essential for success in the Flexbone. So with these factors in mind, here is how I try to build my offensive line with respect to physical ability and size. When thinking about fitting the pieces together for a Flexbone offensive line, it is important to consider the defenses you will face on your schedule. For instance, if you are playing against a 50 front every week you might need to put a larger, stronger player at Center. Currently I see mostly 40 fronts, and therefore I implement a slightly different strategy. I want athletes with a strong work ethic and a desire to get the job done by any means possible. I always try to build the Flexbone offensive line from the middle out. This means starting with the Center. In many coaching circles it is conventional wisdom to put your worst starter in this position. I have even heard some coaches say the only thing they need from their Center is to get the ball to the quarterback. I disagree with this and try to put my best athlete here. My reasoning is simple. I ask this player to scoop to the Mike backer on nearly every play. The Mike backer is usually the opponents best player, or at least their best linebacker. I want to be able to get a body on him and win that battle as often as possible. This is essential for the Inside Veer, which is our most commonly called play. Next I try to put my strongest and heaviest players at guard. They need to be able to get vertical movement at the point of attack and sometimes must block a 2 or a 3 technique on their own. Keep in mind that heaviest in this regard is relative. My guards still need to be able to run well and execute the scoop block effectively. Again, I want athletes. Finally, I put my next two best athletes at tackle. I want these players to run well, execute the scoop, and execute the necessary blocking technique for our Rocket Toss play. Tackles in the Flexbone run the alley and need to block the force player in space. The defensive force player is usually an Outside Linebacker or Safety, so I want my tackles to have the ability to work in space. My tackles are often converted Fullbacks or TE’s. Once I get the type of athlete I want at each position, I strive to teach them to be physical and aggressive at all times. This is accomplished with high expectations on practice tempo and ball get off. I want my offensive line to be chomping at the bit for contact and movement. The Flexbone offensive lineman takes a heavy-handed stance and keeps his feet in a relatively narrow base. Hustling to the LOS – I want my players to sprint to the LOS on every play. They are setting the tone for the offense. Once the huddle is broken, they must sprint to the line and get set. This puts them in the right mind-set and, in my opinion, has a psychological effect on the defense. Aggressive Stance – We use an aggressive stance in the Flexbone. It closely resembles a defensive line stance and helps to build speed into the get off. I want my offensive linemen to have a small stagger, toe to instep, and about 60% of their weight on their down hand. The feet are no wider than their arm pits. I also teach high hips and allow a four-point stance if this is more comfortable for them. Get Off Speed – I want my players to have two steps in the ground before the Defensive Line even moves. I teach my linemen to move on the sound of the first letter of our cadence. We snap the ball on the word “GO” and I emphasize movement on the sound of the “G”. Along with this, we practice our footwork on a daily basis. We drill the first two steps of each of our blocking techniques constantly and I demand perfection. We also spend alot of time in the off-season on speed and agility work out of a bunched sprinters starting stance. Aggressiveness – I spend a lot of time in practice demanding aggressiveness and tenacity in EVERY drill. Players execute at full speed. If the rep is bad, they do it again. Every time. Finishing – I teach my players to execute through the echo of the whistle. Along with this, I utilize a variety of drills that emphasize finishing blocks and following through. We teach our players to “Finish through the throat.” The key is to teach your players that quitting is NEVER an option and that the play isn’t over until the echo of the whistle stops. How do you build your offensive line? What criteria do you use when trying to put the pieces together to put your best offensive line on the field? Let me know your thoughts and techniques in the comments below.